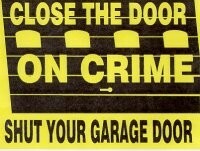 Burglars spot open garage doors and remove visible items in a matter of seconds. In many instances, the home owners are home and even outside when the burglary takes place. Or other valuables left inside vehicles parked in the garage. If you notice your neighbors garage door open, please be a good neighbor and remind them of the importance of keeping their garage doors closed! Neighbors looking out for one another is the single most effective crime prevention tool. When a Menomonee Falls police officer on patrol notices your garage door open and unattended, we may call your residence and ask for you to close it, for security reasons. Many of these requests are made during evening hours, when opportunistic criminal activity occurs most often. If you see suspicious activity in your neighborhood call the Menomonee Falls Police Department at (262) 532-1700 or 9-1-1 immediately for crimes in progress.